REVEL™ is Pearson’s newest way of delivering our respected content. Fully digital and highly engaging, REVEL offers an immersive learning experience designed for the way today's students read, think, and learn. Enlivening course content with media interactives and assessments, REVEL empowers educators to increase engagement with the course, and to better connect with students. 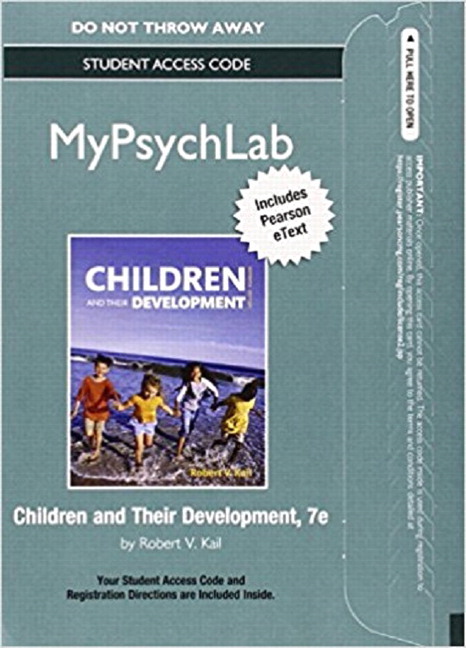 Organized topically and focused on practice, REVEL for Children and Their Development , Seventh Edition shows students the way scientists actually conduct research and study the discipline. 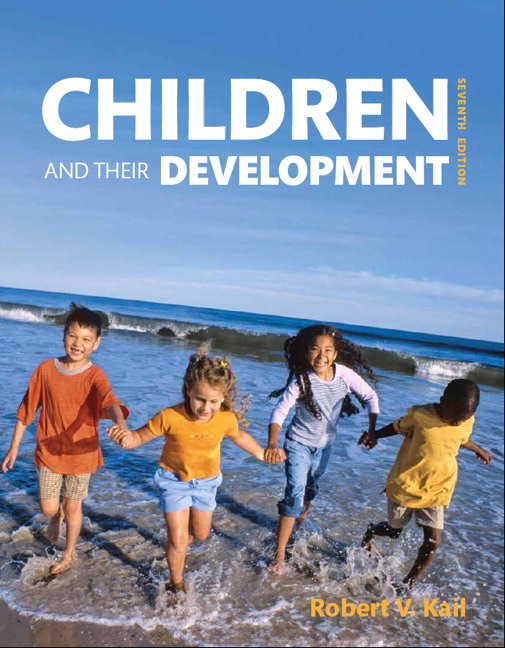 A well-known and respected researcher in the field of child development, author Robert V. Kail provides a path to explore the theory, research, and application of modern child development from conception through adolescence. 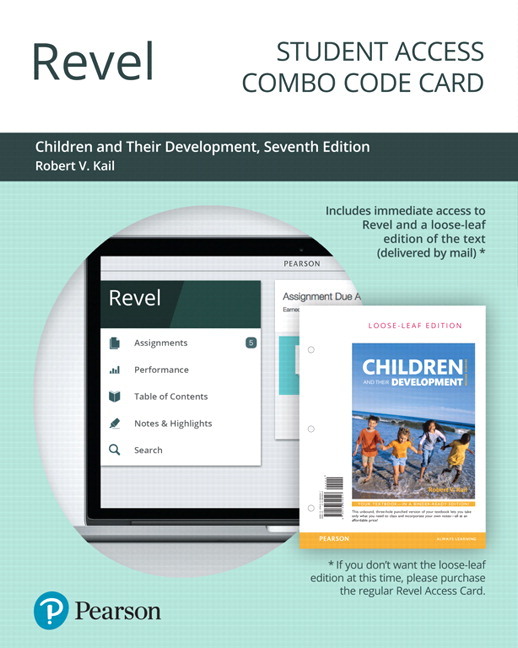 REVEL for Children and Their Development ’s accessible writing, modular format, and application-based features are designed to work together to help students see how research translates into practice. REVEL’s performance dashboard lets educators monitor class assignment completion as well as individual student achievement. 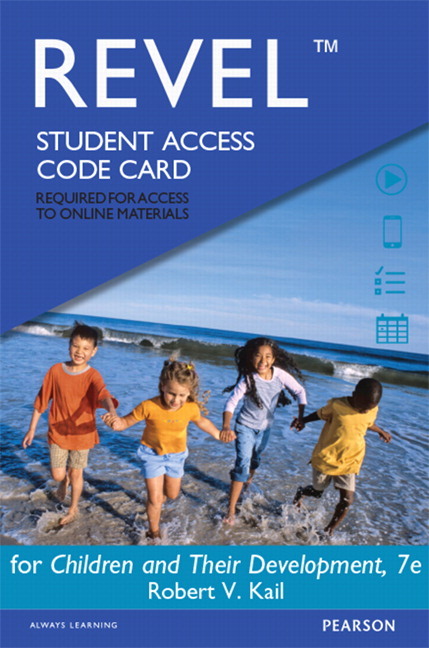 It offers actionable information that helps educators intersect with their students in meaningful ways, such as points earned on quizzes and tests and time on task. Of particular note, the trending column reveals whether students' grades are improving or declining – which helps educators identify students who might need help to stay on track. Module Organization. The focus on a student-friendly book begins with the structure of the chapters. Each chapter consists of three or four modules that provide a clear and well-defined organization to the chapter. Chapter-opening Introductions. Learning Objectives and Vignettes at the start of each module introduce the topic to be covered, helping to guide students on important subjects in each section. Fully integrates Features. Special topics that are set off in other textbooks as feature boxes are fully integrated with the main text and identified by a distinctive icon. Self-Testing Material. Test Yourself questions at the end of each chapter confirm and cement students’ understanding of the chapter material. Highlights Key Terms. The Key Terms section lists all of the important boldfaced terms appearing in the chapter. Chapter-ending Summaries. The Summary is a concise review of the chapter helping students to recall important themes of the chapter. Reillarates Foundation Throughout Narrative. Four foundation issues, Continuity, Nature and nurture, Active children and Connections, are introduced in Chapter 1 and then reappear in subsequent chapters to scaffold students’ understanding. By occurring repeatedly throughout the text, the themes remind students of the core issues that drive child-development science. Illustrates Foundational Themes. The Unifying Themes feature links the ideas in the chapter to one of the major foundational themes. Connects Theory and Research. Spotlight on Theories examines an influential theory of development and shows how it has been tested in research. NEW! Examines Real Research. The Focus on Research feature provides details on the design and methods used in a particular research study. The easy-to-read, question-and-answer formatted feature closely examines specific studies, demystifies research, and shows that scientific work is a series of logical steps conducted by real people. New topics covered include: hereditary bases of peer relationships, links between maternal depression and children’s behavior problems, long-term consequences of temperament, and more. Firsthand Views. The See for Yourself featuressuggest activities that allow students to observe topics in child development firsthand. Examine Culture’s Impact. Cultural Influences shows how culture influences children and illustrates that developmental journeys are diverse. All children share the biological aspects of development, but their cultural contexts differ. This feature celebrates the developmental experiences of children from different backgrounds. Influence Children’s Lives. Improving Children’s Lives shows how research and theory can be applied to improve children’s development. These practical solutions to everyday problems show the relevance of research and theory to real life. Apply Research. Child Development and Family Policy shows how results from research are used to create social policy that is designed to improve the lives of children and their families. Pearson MyTest. This powerful assessment generation program includes all of the items in the instructor’s manual/test bank. Questions and tests can be easily created, customized, saved online, and then printed, allowing flexibility to manage assessments anytime and anywhere. PowerPoints. Organized around a lecture outline, these multimedia presentations also include photos, figures, and tables from each chapter. NEW! Examines Real Research. The Focus on Research feature illustrates –in an easy-to-read, question-and-answer format–the different decisions that investigators make in designing a particular study. Each feature ends by mentioning the kind of converging evidence that would strengthen the authors’ conclusions. New topics covered include: hereditary bases of peer relationships, links between maternal depression and children’s behavior problems, long-term consequences of temperament, and more. Updated examples of different research methods. New material about methylation as an epigenetic mechanism. contains much-revised coverage of executive function and of naïve psychology (now called folk psychology).